A place of remarkable natural beauty with its tranquil glens, lush forests and a vibrant, ancient city which is also Scotland’s most recent, Perthshire offers visitors centuries of history alongside adrenaline-packed adventure, delicious food and drink, an incredible array of wildlife, some of the most exciting events and festivals in the country and much more. See why Sir Walter Scott and Robert Burns found literary inspiration in the region’s spellbinding landscape in their works on a visit to the region’s ‘Big Tree Country’ where you’ll find dramatic waterfalls, peaceful glens and ancient trees including the Birnam Oak, said to be the last survivor of the oak forest portrayed in Shakespeare’s Macbeth. Spend pleasant days relaxing and unwinding in some of the finest formal gardens in Europe and beautifully maintained parks. Visit in autumn when the forests and woodlands turn dazzling crimson and golden hues. Venture into the beautiful wilderness of Highland Perthshire and scale mountains and hills like Schiehallion and Ben Lawers while keeping your eyes peeled for rare wildlife and plants including delicate Arctic plants, red deer and even golden eagles. Explore delightful towns and villages, all of which boast their own special charm, history and attractions, and discover the cultural delights of Perth, Scotland’s seventh city. Visit one of the oldest museums in the UK, indulge in fantastic shopping and enjoy great music, dance and theatre performances at the city’s superb venues. Sample the region’s delicious local food and drink at farmers' markets and superb restaurants, bars and pubs. Visit some of the most historic distilleries in the country and learn about the centuries-old art of whisky production. Immerse yourself in the region’s compelling past at atmospheric castles and amazingly well preserved historic buildings and homes. Uncover more of the region’s history at a diverse array of museums and historic sites where you can view fascinating artefacts and see where pivotal events in Scottish history took place. Whatever time of year you visit Perthshire, there’s always a fantastic selection of events and festivals to choose from. Witness the region’s proud traditions and customs at spectacular Highland games and other countryside events, attend internationally acclaimed arts festivals, and enjoy fantastic live music at a range of events, from the unique Perthshire Amber Festival to T in the Park, Scotland’s biggest musical extravaganza. 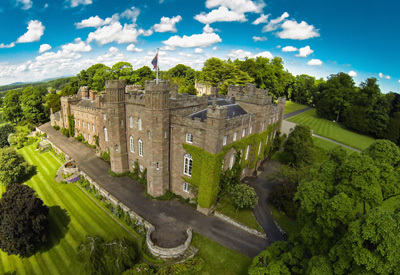 Click here to find out more about Perthshire.